I shared my attempt of Mee Jian Kueh (MJK) using yeast not long time ago. Yesterday I made MJK again but this time I used baking powder instead. This baking powder version does not need proofing, so it’s kind of convenient, one can just make as and when feel like making. I think both versions taste very similar, to be frank, I can’t really tell the difference. I guess only if I can have both at the same time then I can tell the difference. 3) Sift in (C) in batches, mix well. Add (D), mix till just combined. 4) Pour the batter in HCP, close the lid with magnet. Cook over low heat for about 8-9 mins. If you want the skin to have even colour, move the pan left and right every now and then. When the skin is brown and the surface is set with tiny holes, it is done. Add fillings and fold into half. Slice and serve. 1) Suggest cooking in two batches as I find the MJK is too thick. If cook in two batches, the cooking time should be shorter, please adjust accordingly. 2) You may use a regular non-stick pan for this but need to adjust the cooking time depending on your pan. I am submitting this to Bake Along # 14 - Pancakes & Crepes hosted by Frozen Wings (Lena), Kitchen Flavours (Joyce) and Bake for Happy Kids (Zoe). Hi! This looks wonderful! It looks fluffy and soft! 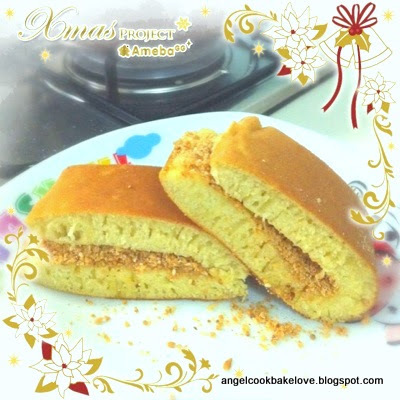 My kids love this with the peanut filling. 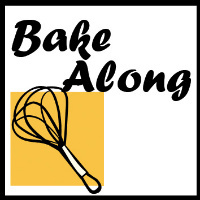 Thank you for joining our Bake-Along! Do join us again! Wish you a great week ahead! hi angel, nice to see you joining our bake along. The last time i made apam balik was the crispy type, actually wanted to make the fluffy type like yours too but just couldnt do it. What is happycall? is it something like a magic cooker or pressure cooker? you suggested cooking in 2 batches because you find it too thick! But this is the kind that I like, thick and spongy and fluffy (: I think apam balik is actually quite different from MJK, apam balik is thinner, and I think, more common in Malaysia. Is there really no difference between yeast and baking powder? I've been trying to look for a good MJK recipe! At the end, I lost my appetite. I want to make the crispy type too, it's in my next to-do list. Happycall is a double-sided pressure pan from Korea. Happycall is the brand name. You can may take a look here. I get what you mean, apam balik is the thin and crispy type. I make it thicker this time becauze my mum likes thick MJK like you but end up she also commented this is too thick for her. Last night I tried to make into 2pcs and she commented too thin so I guess I need to adjust the recipe to suit the size of my pan. I think they must be differences between the yeast version and this version, if really want me to recall must be the yeast one is slightly more springy and chewy? I can't tell exactly unless I can taste both at the same time. Do try it out one of these recipes, both are quite good. 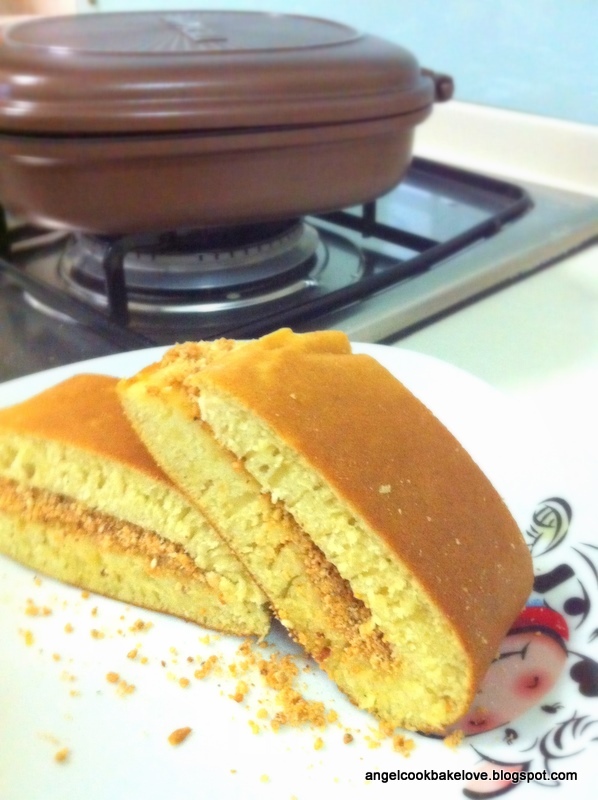 Look fluffy and nice, long time did not make this, am too lazy to make this, better buy from Malay stall, hehehe.. I love eating traditional food especially it is home made. I'm sorry that I've missed out this bake-along post due to hectic Christmas preparation. Hope to hear from you again for our future bake-along.